This commentary discusses whether screening for type 2 diabetes or earlier normalisation of blood glucose levels or initiation of non-antihyperglycaemic agents or any other diabetes-specific treatment can help reduce the excess associated risks for macrovascular morbidity and mortality. The available data indicate that screening with the sole aim of decreasing the lead time between diagnosis and treatment is very unlikely to reduce these risks. In contrast to macrovascular complications, some microvascular events such as background retinopathy could theoretically be prevented by earlier diagnosis and better glycaemic control, particularly in relatively young type 2 diabetic patients. This, however, remains to be shown in controlled prospective intervention trials. The rising prevalence of type 2 diabetes is predicted to further increase worldwide and will continue to create a considerable burden of suffering and health costs . The main problem, which remains unsolved, is still the excessive risk of cardio- and cerebrovascular morbidity and mortality. Most disappointingly, broadly effective population-based diabetes prevention programmes are not in sight  and even very sophisticated intensified blood glucose treatment strategies have not yielded satisfying results in type 2 diabetes . This has prompted ideas for alternative approaches, including the hypothesis that we may be failing because we intervene too late. Indeed, the onset of type 2 diabetes may occur more than 5 years before the diagnosis . 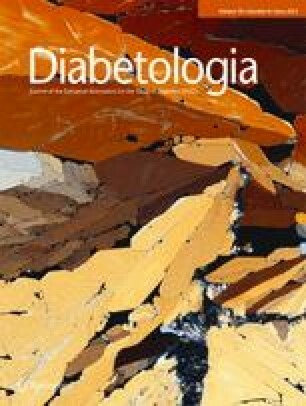 In the UK Prospective Diabetes Study (UKPDS), 50% of newly diagnosed patients with relatively good metabolic control already had diabetes-related complications  and in the Hoorn study the prevalence of macrovascular complications was higher in the unscreened population compared with the screened sample . These data created the hope that screening for type 2 diabetes would identify diabetic patients before complications develop and subsequent intensified treatment strategies could reduce the risk . But is this hope realistic? Benefits from earlier reduction of glycaemia? In epidemiological studies the major burden of diabetes—the excessive risk of cardio- and cerebrovascular morbidity and mortality—is already present before blood glucose concentrations reach diabetic values . Despite the fact that in observational studies glycaemia is closely associated with cardiovascular risk , we now have convincing evidence from randomised controlled trials that, with the use of intensive glycaemic control in type 2 diabetes, including in those patients in the early stages of the disease, there is no reduction in all-cause mortality . In fact, a reduction in HbA1c of about 0.9% (9.8 mmol/mol) over a period of 4–5 years increased the risk ratio for total mortality non-significantly by 1.02 (95% CI 0.91, 1.13), significantly reduced non-fatal myocardial infarction by around 0.24% (absolute risk reduction) but had no impact on microvascular hard endpoints [10, 11]. Benefits from earlier initiation of non-antihyperglycaemic treatment options? Screening that results in decreasing the delay between diagnosis and treatment is of course not limited to the lowering of blood glucose, but could potentially cover all effective treatment options for the reduction of cardiovascular risk. However, are there, at present, any possible interventions that are proven to be effective primarily in diabetic, but not in non-diabetic, patients at risk for cardiovascular events? Interventions that have been proposed as relevant only for patients with diabetes include specific therapeutic target levels for blood pressure and cholesterol, as well as different classes of antihypertensive drug treatment and prescription of acetylsalicylic acid. However, a meta-analysis provided evidence that different antihypertensive regimens had comparable effects on cardiovascular events in diabetic and non-diabetic patients . Furthermore, there is limited evidence that lower blood pressure goals are more effective in hypertensive diabetic, compared with non-diabetic, patients . It should be noted, however, that this meta-analysis included several trials with control groups in which blood pressure was kept above the normotensive threshold of 140/90 mmHg, and so does not answer the question of whether normotensive patients with diabetes benefit from antihypertensive treatment. The Action to Control Cardiovascular Risk in Diabetes trial examined the benefits of lowering of systolic blood pressure to <120 versus lowering to <140 mmHg . After a mean follow-up of 4.7 years the primary composite outcome (non-fatal myocardial infarction, non-fatal stroke, or death from cardiovascular causes) was not significantly different between the study groups, indicating no benefit of blood pressure lowering within the normotensive range in diabetic patients . Of course, effective antihypertensive treatment should be offered to all hypertensive patients irrespective of their blood glucose concentrations. Likewise, the effects of cholesterol lowering treatment with statins yielded similar results in diabetic and non-diabetic patients; most importantly, in both groups the beneficial effect of statins was independent of the pre-treatment blood cholesterol levels . No data from randomised controlled trials are available to answer the question of whether cholesterol treatment targets should differ between diabetic and non-diabetic patients. Hence, in my view, it can be asserted on the basis of the published evidence to date that LDL-cholesterol targets need not be different in people with and without diabetes. To date, the results of acetylsalicylic acid treatment for primary prevention of cardiovascular events are, all in all, somewhat inconclusive and a recent meta-analysis could not demonstrate a clear benefit of acetylsalicylic acid for primary prevention in diabetic patients. However, this result may differ between men and women . Information regarding the presence or absence of diabetes could potentially improve patients’ and doctors’ treatment decisions. Patients with diabetes face a higher risk of cardiovascular complications and the number needed to treat is, in most cases, lower for diabetic patients. However, some risk calculators do not include the variable ‘diabetes’ [16, 17]. Furthermore, the National Institute for Health and Clinical Excellence (NICE) states that those who are 40 years of age or older and have an additional risk factor such as diabetes are automatically considered to be at high risk for cardiovascular disease and a risk calculation is not necessary . Therefore, the information derived from current risk calculators is very often insufficient to support patients’ decisions for or against a certain treatment. In addition, there is no evidence that treatment decisions either with or without such information would lead to improved outcomes or to higher patient or doctor satisfaction. The Anglo–Danish–Dutch Study of Intensive Treatment in People with Screen Detected Diabetes in Primary Care (ADDITION) trial investigated the effect of early multifactorial treatment after a diabetes diagnosis by screening in a population between 40 and 69 years in a cluster-randomised study design . The intervention included lowering of blood glucose to an HbA1c target below 7% (53 mmol/mol), maintaining blood pressure ≤135/85 mmHg and keeping total cholesterol <5 mmol/l in patients without, and <4.5 mmol/l in patients with, ischaemic heart disease. Furthermore, acetylsalicylic acid was added in patients receiving antihypertensive medication. In the control group, family physicians were only provided with the diagnostic test results, and then provided routine care. The treatment effects on HbA1c yielded only small differences between the groups while blood pressure and total- and LDL-cholesterol were reduced to a greater extent, and acetylsalicylic acid was prescribed more often, in the intervention group. After a mean follow-up of 5.3 years the risk of a first cardiovascular event was not significantly reduced by an earlier intensification of treatment. It is important to bear in mind that this trial did not directly assess the effects of screening for diabetes since screening was initiated in both study groups and only the intensity of subsequent treatment differed. In this issue of Diabetologia, Rahman and colleagues present the long-term results of a parallel group cohort screening intervention of the Ely cohort . A random non-diabetic sample from this cohort aged 40–65 years was invited at baseline to participate in screening for diabetes and cardiovascular risk factors every 5 years. These patients were then compared with randomly selected individuals who were invited to a screening for diabetes 10 years later. In total, 199 patients with diabetes were registered, of which 116 were in the screened and 83 in the unscreened population. The median duration of diabetes was 5 years in the screened and 1.7 years in the unscreened sample. At follow-up, glycaemic control was better in the screened population (HbA1c 7.0% vs 7.4%; 53.0 vs 57.4 mmol/mol); however, this difference was not statistically significant. In the screened patient group, non-proliferative diabetic retinopathy and peripheral neuropathy were non-significantly less common (21% and 34%, respectively) compared with the unscreened group (35% and 39%, respectively). Microalbuminuria occurred in 22% vs 23% of patients and macroalbuminuria was present in four screened and one unscreened patient. Cases of stroke, myocardial infarction and ischaemic heart disease were comparable between the groups. It is possible that this study was too small to show statistically significant effects of earlier diagnosis and treatment of the diabetes-related risk of non-proliferative diabetic retinopathy and neuropathy, but in any case these results do not support the presence of an important impact of screening on diabetic complications. In a previous report from the same study, a non-significantly lower mortality risk in the screened cohort was reported . However, this was the case only in the period between 1990 and 1999 and was not replicated in the period between 2000 and 2008. Taken together, the Ely cohort screening study failed to show any long-term benefit from screening for diabetes. It is possible that screening using HbA1c values could yield better results than using an oral glucose challenge. It would immediately identify those patients who are at the highest risk of complications and benefit most from antihyperglycaemic intervention. However, the value of this remains to be shown. Screening for diabetes might not be totally harmless. The diagnosis of diabetes is not generally associated with important adverse events [22, 23]. However, short-term anxiety may increase . In one trial it was found that patients who screened positive perceived their general health to be significantly poorer and exhibited a higher state of anxiety, worry and depression . These effects were small but the long-term social and psychological impact resulting from the labelling of screen-detected diabetic patients has not been well evaluated. Screening negatively for diabetes does not seem to promote false reassurance . However, it may detract the physician’s attention from the scrupulous control of cardiovascular risk factors in non-diabetic patients, leading to sub-optimal control compared with patients who screened positive for diabetes . Most importantly, the diagnosis of diabetes can also have other negative impacts on patients’ life such as increased insurance premiums and difficulties with employment. In summary, the conclusion that needs to be drawn is disappointing: macrovascular pathology develops long before diabetes is present and intensive blood glucose treatment does not reduce this mortality risk. So far, randomised controlled trials have not identified any treatment geared towards the reduction of cardiovascular risk that would be effective in diabetic patients only, as opposed to a non-diabetic population. Once an indication is present, earlier specific therapeutic interventions in eligible patients should be considered irrespective of the presence of diabetes, and the vast majority, if not all, effective treatment options should be considered in both diabetic and non-diabetic patients. Furthermore, earlier intensive multifactorial treatment in screen-detected diabetic patients has yielded no better results than treatment undertaken at a later point . No statistically significant reduction in diabetic complications occurred in the group of screen-detected, compared with routinely detected, diabetic patients [20, 21]. If this is true, then screening for diabetes with the sole aim of decreasing the lead time between diagnosis and treatment is very unlikely to reduce the major burden of macrovascular morbidity and mortality in type 2 diabetes. In contrast to macrovascular complications, some microvascular events such as background retinopathy could theoretically be prevented by an earlier diagnosis and better glycaemic control, particularly in relatively young type 2 diabetic patients. This, however, remains to be shown in controlled prospective intervention trials. It is probable that such a hypothetical reduction of background retinopathy can only be achieved in a small subsample of type 2 diabetic patients and may possibly reduce the need for laser-photocoagulation in a few, whereas it is unlikely that cases of blindness could be prevented. Facing the continuously increasing number of diabetic patients, the maximal potential benefit derived from screening for diabetes is relatively small compared with what we will have to achieve in future diabetes care. Thus, instead of waiting for studies showing positive effects of overall screening for diabetes, we should initiate detection and treatment programmes to systematically identify and treat diabetic patients at risk for complications such as leg amputations, which can effectively be prevented . The author was solely responsible for the conception, drafting and final approval of this article.